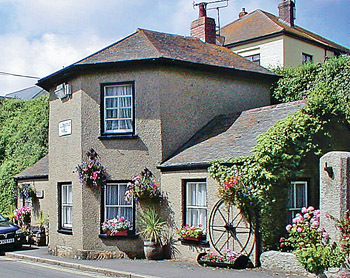 The Old Toll House stands within a short stroll of the sandy beach, shops, restaurants and pubs of the village of Marazion on lovely Mounts Bay. 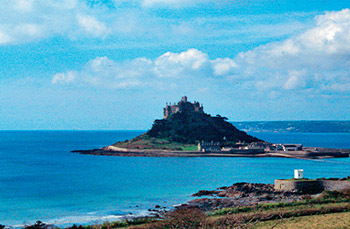 Dominating the bay is majestic St Michael's Mount (pictured), which can be accessed by a stone causeway at low tide, and there are many fine sandy beaches nearby including the surfing beach at Sennen. About 4 miles away lies the bustling town of Penzance from where day trips to the Isles of Scilly can be taken by helicopter or ferry. The Minack Open Air Theatre, Land's End, Paradise Park and St Ives, with its Tate Gallery, are all within a short drive. Shops and pubs 100 yards. Two bedrooms. Comfortable beamed sitting/dining room with electric fire. Small kitchen. Bunk bedded room with 4' bed and 3' top bunk over (for + child). Bathroom/W.C. with corner bath and shower over. Narrow steep stairs to first floor: Double bedroom.